Sarcocornia fruticosa is not rare along the Cretan beaches, but it is not seen very often because it prefers the beaches that tourists avoid: rocky beaches. And on first sight it is a simple plant. In Sfikas’ Wild Flowers of Crete they are not described “because they are of no special decorative interest”. Does that mean that it is not an interesting plant? Please come a little bit closer and take a careful look. The stems of the plant appear to be build up of beads, without leaves, and during the flowering period suddenly anthers appear out of these naked stems. But appearances are deceptive. The taxonomy of this family is difficult and controversial. To give you an impression: a plant that in 2001 was called Salicornia perennis P. Mill., in 2004 it was called Arthrocnemun perenne(P. Mill.) Moss, and in 2006 it was called Sarcocornia perennis (P. Mill.) A.J. Scott. And next year? Who knows. On the rocky parts of the beach of Sfinari, Western Crete, I found in May several small (approx.30-40 cm high) shrubs of a glasswort and collected some in order to determine them. I had read in a flora that there is little benefit in collecting plants in order to dry them (to preserve them on a herbarium-sheet), because the characters that may be important for determination, are lost after drying, especially flower and inflorescence characters. The dried plants rarely allow for a reliable determination of the habit difference. Also, seeds are rarely present in dry herbarium specimens because plants collected in May or June (the best Cretan flowering season) don’t have even immature seeds. So, I collected on spirit (70% ethanol). Plants were abundantly flowering. I always collect in spring or summer, and in the winter back in my comfortably heated atelier supplied with all modern conveniences, I made the drawing that you can find below. But to which family and genus did it belong? I “keyed” out at Sarcocornia. First let’s have a look at the whole family. 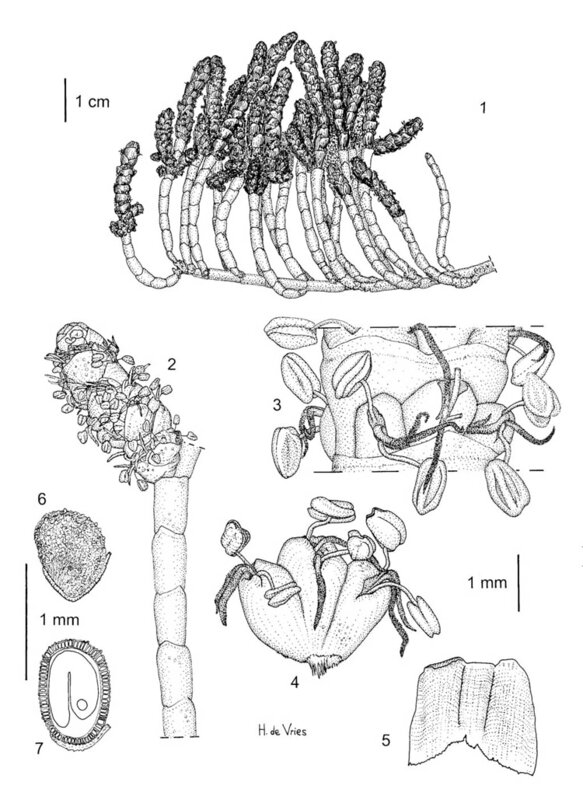 The Chenopodiaceae-Salicornioideae-Sarcocornia are distributed worldwide mostly in coastal saline habitats. They are easily recognized by their succulent-articulated stem, by the seemingly absence of leaves and by flowers that are aggregated in dense, thick spike-shaped cymes. The plants draw the attention because they show these already mentioned special morphological adaptations, please take a look at drawing “1”, at the habit. The prostate, somewhat woody, branched main stems are apparently jointed and fleshy when they are young. Older stems become woody. They are composed of cylindrical internodes, each with a fleshy covering giving the internodes their characteristic articulated barrel-shaped appearance. Many stems are terminated by an inflorescence, while some stay entirely vegetative. These inflorescences look like spikes, where each joint consists of 2 opposite 3-flowered cymes partly hidden in the fleshy tissue of the internode.The flowers in each cyme are sitting in the axis of these fleshy leaves and are free from each other and from the leaves or only basally fused. Each cyme is arranged in transverse rows, the central flower is slightly larger than the two lateral flowers and reaches almost to the upper edge of the segment. The leaves are strongly reduced and form a cup-like structure or cavities that hide the lower parts of the flowers. During flowering the two anthers and the style are exserted through the narrow opening formed by the 3 to 4 fused perianth segments. The style is divided into 2 stigma lobes. 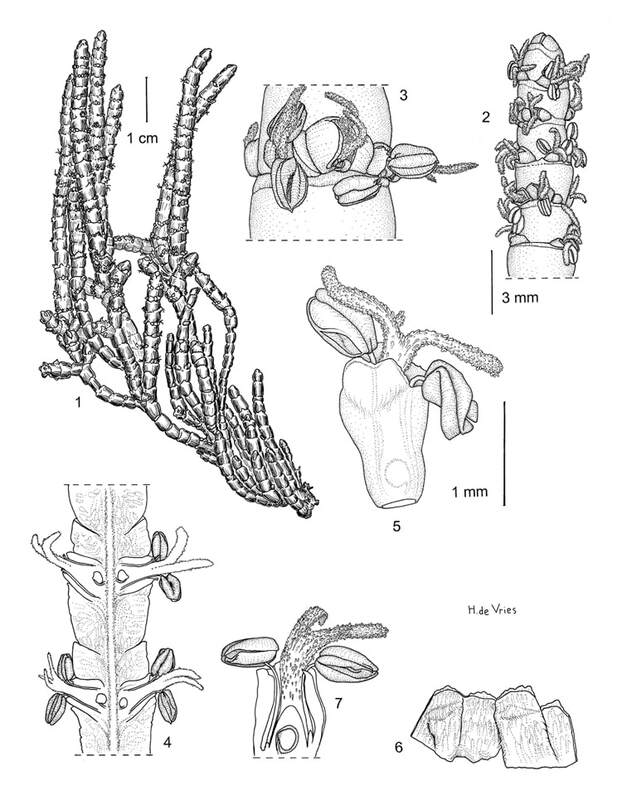 Since revisions in the late twentieth century, most genera have been clearly circumscribed but some uncertainties remain, in particular with the boundaries of Arthrocnemum, Salicornia and Sarcocornia. 3. Plants perennial shrubs; many stems entirely vegetative; leaves collar-like; flowers positioned at more or less equal height, free or only basally fused with each other and the bract, flowers of each cyme adnate to distal branch of inflorescence; perianth-segments 2 – 4 –lobed; the seeds are membranous, in the shape of a disc and hairy or papillose, the embryo in the shape of a horseshoe; perisperm: reduced or absent: Sarcocornia. the annual habit and the triangular arrangement of the unequal-sized flowers in Salicornia. Many authors questioned this separation. In particular, the annual or shrubby life-form is a weak character. However, the consistently different arrangement of flowers in Sarcocornia and Salicornia has found broader acceptance. In the Mediterranean region there are two species of Sarcocornia: S.perennis and S.fruticosa. S.perennis: plants are mostly creeping, rooting where they touch the ground, with subterranean stems, sometimes forming large tufts, height 10 – 20 cm; seeds with curved or hooked hairs. S.fruticosa: plants upright, without underground or creeping stems, 30 – 120 cm high; seeds with short, conical hairs. The plants that I found in Sfinari were perennial shrubs (so they were not Salicornia) and the flowers are arranged in horizontal rows and adnate (so they are not Arthrocnemum). I have been at the same spot many years and I have never found seeds. That is a pity indeed, because the seeds carry some very important (taxonomical) characters. Still, taking into account the adnate flowers and the shrubby habit, for the moment it seems quite safe to conclude that my plants are Sarcocornia fruticosa, see drawing 1. If you take a look at drawing 1, you’ll find in detail number ‘1’ the characteristic habit. Detail 2 shows a part of a flowering branch, detail 3 is one inflorescence, one cyme. Detail 4 is a lengthwise section of a part of a flowering branch, 5 shows an isolated flower, 6 an opened four-lobed perianth and 7 a lengthwise section of one flower. I also found plants in Agioi Apostoloi, Chania. It is a famous tourists resort with beautiful sandy beaches and bays, separated by some rocky spurs. And below these rocks I found some more plants. They were a little different from the ones that I found in Sfinari. The habit looked more ‘full’ and the flowers appeared more ‘messy’, more ‘crowded’ and the perianth existed consequently of three fused segments (the first and the third segments fleshy, spongy) instead of the four membranous segments that I always found in flowers from Sfinari. But this time I found seeds and these easily convinced me that these plants were also Sarcocornia fruticosa, see drawing 2. In drawing 2 you’ll find the following details: ‘1’ shows a part of the habit (the main stem is upright and not shown in the drawing, the secondary stems are horizontally and the tertiary, flowering branches are again upright); ‘2’ is a detail of a flowering branch, 3 is again a detail of ‘2’, in 4 I have removed the whole cyme showing that the three flowers are only basally fused with each other and with the leaf, 5 shows the opened perianth (inside view), 6 is the seed from the outside and 7 is a transverse section of a seed showing the horseshoe-shaped embryo. Common names: perennial saltwort, perennial glasswort, perennial marsh samphire, chickenclaws. The vernacular name ‘samphire’ is derived from ‘sampere’, an early English name from the French ‘herbe de St.Pierre’(Wilson 1980). The common name ‘glasswort’ (perhaps) arose from the use of its soda-rich ashes in early glass making. It could also refer to the sound of breaking glass it makes when you break or tread upon a stem.